Pittsburgh Penguins general manager Ray Shero can still recall the good old days when he took the ice as captain for St. Lawrence University against Providence College and coach Lou Lamoriello. "I followed his career when he became athletic director at Providence and then left to go to the Devils in 1987, and to see where his career has gone is fantastic," Shero told NHL.com. "I'd just gotten out of school when he went to New Jersey. I think what really stands out to me is his honest approach in dealing with people and with his teams." Shero can vividly recall spending time with Lamoriello in his early years as an NHL executive. "We were there playing a game one night and while I was there for a morning skate, he invited me to his office and I spent maybe an hour with him and learned a great deal about dealing with people, your players, your personnel, your assistants … the honest way in which to evaluate a hockey team," Shero said. "I think that's the way he carries himself and he has the respect of all the managers." Shero, who was hired as Penguins' general manager on May 25, 2006, considers Lamoriello to be one of the best GMs in the business. "It's a great story coming from college hockey to becoming a Hockey Hall of Famer, and maybe one of the best general managers of all time," Shero said. "To be able to spend some time with him to see how he does things, to see how he treats people, it was pretty special." Shero, the son of former Philadelphia Flyers coach Fred Shero, celebrated his only Stanley Cup in 2009. One memory he has from that championship is a letter of congratulations he received from Lamoriello. Costello's impact extends to U.S.
"When we won the Cup in '09, you get a lot of texts and letters and I still have the letter he wrote to me," Shero said. "It meant a great deal to me. He's just a genuine guy." Prior to joining the Penguins in 2006, Shero was an assistant GM with the Ottawa Senators from 1993-98 before joining the Nashville Predators in the same capacity from '98 through 2006. "Lou is a great asset for the game, a great ambassador, really smart," Shero said. "When I first came in as an assistant GM and was able to go to the GM meetings, Harry Sinden [of the Boston Bruins] was there. You hear about Harry, but then you see him and hear his ideas and it's the same thing [as Lamoriello]. It's pretty amazing how smart he is about the game of hockey." Shero marvels at Lamoriello's three Cup crowns and 21 playoff appearances in his 24 seasons at the helm as general manager of the Devils. "You always looked at Lou as kind of being 'the guy' with what he has done with the Devils, winning three Stanley Cups … the foundation he has laid and the way he has done his business," Shero said. "He's respected so much throughout the League and I think amongst the players as well." Shero has always considered it a privilege to sit in the same room as Lamoriello during the GM meetings. 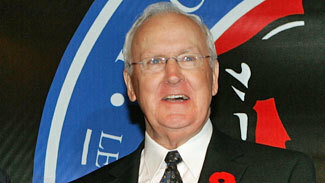 He was also happy to hear that Lamoriello will be inducted into the U.S. Hockey Hall of Fame on Monday. "When he does say something to the group on improvements to the game, it's not about the Devils but about the game of hockey and trying to make it better," Shero said. "It's about what is right, what is wrong, and being honest about the game. That's what makes him a pretty special person."